Today, I received my new Filson 238 Outfitter Bag (Large) in the mail and I wanted to share my first impressions of this unique piece of luggage. First, the bag is huge. When full, it measures 20” wide, 18” tall and 14” deep. It is too large for carry on travel, so it would need to be checked at the airport. However, it would make the perfect weekender for camping, hunting, skiing or snowboarding. Layout: (1) main compartment; (1) wet/dry compartment; (2) full-length exterior zippered pockets; (2) open exterior end-pockets and (2) full-length interior side pockets. NOTE: this is the Large Outfitter bag. Filson also makes an Extra-large Outfitter Bag 239, although I am not sure it would as practical due to the weight when full. The Large size seems to offer the best tradeoff between capacity and ease-of-use. I own many other Filson bags, but this one definitely takes the build quality up a notch. The main sides of the 238 are double-walled to create full-length exterior zipper pockets and there are also two interior pockets that run the entire length of the bag. The leather straps are much wider on this bag than on my other Filson pieces and the handles continue in one solid piece across the bottom (unlike the small Duffle Bag (220) and the medium Travel Bag (246) which both use a split strap design underneath). NOTE: I chose Otter Green, because I tend to prefer darker colors for travel-size pieces that will need to endure rougher handling and wetter/dirtier conditions. The most unique feature of the Outfitter bag is the spacious zippered compartment (on the bottom) that is nearly 6” tall. It is designed to keep wet/muddy clothing/boots separated from the other gear stored in the main compartment. In addition, this compartment is designed to collapse when it is not being used, thereby reducing the overall dimensions of the bag and making it much more manageable. In fact, when the bottom compartment is flat, this bag is very similar (in both function and appearance) to the large Filson Travel Bag (248). I highly recommend this bag to anyone that needs a go-anywhere, do-anything travel case that can move a lot of wet or dry gear in style. The Large Outfitter exudes quality and seems rugged enough to tackle any task you can throw at it. I was looking for a good Filson bag to work as an overnight or short business trip bag that can carry 1 or 2 trousers, a few shirts and a sweater/blazer or two, etc. Something that is on the lighter side and reasonably priced for a Filson bag. I looked through many options and couldn’t decide so I thought I might ask you for your input. Thanks! 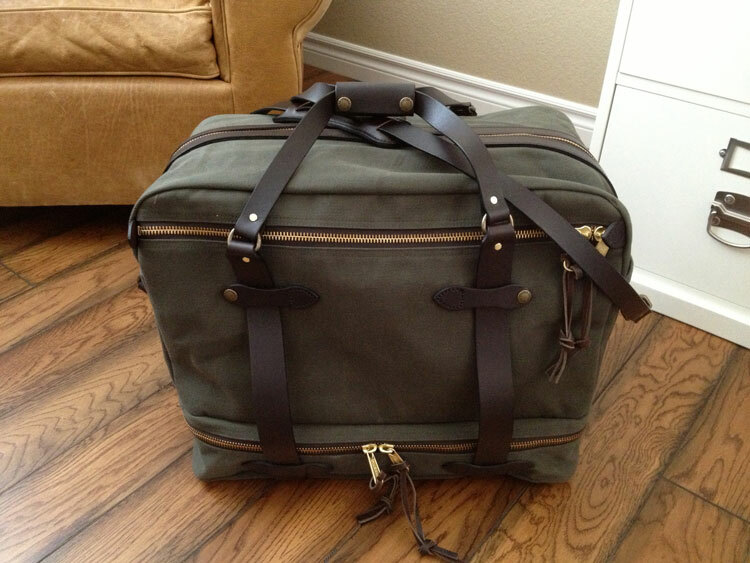 I have the perfect recommendation for you…the Filson Medium Travel Bag #246. It is carry-on compliant, has two full-length exterior pockets, two full-size end pockets and two full-length interior pockets. This is my go-to bag for most travel purposes. One of the best things about the 246 is the design. If the bag is not completely full, it automatically compresses in on the sides to create a very streamlined case that is very comfortable to carry. As you fill the bag to capacity, it expands to its full dimensions. It is not too heavy and has just the right amount of organization. It includes carry handles (with hand grip) as well as a shoulder strap. The 246 retails for $295 USD, but can be found online for around $236 (at Joe’s Sporting Goods this week for example). 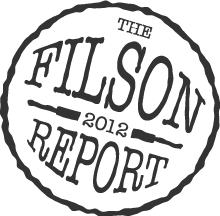 I give this Filson my highest recommendation and it sounds like exactly what you are looking for. Thanks for the reply. Is the one you reviewed still up for sale? If so, I’m guessing you don’t ship internationally? You are very welcome. The 246 that I own is one of my favorite bags. I do not currently have one available for sale, but if I come across another one, I will be sure to let you know. Does the Large Outfitter bag work as a carryon if the bottom section is left empty and collapsed? 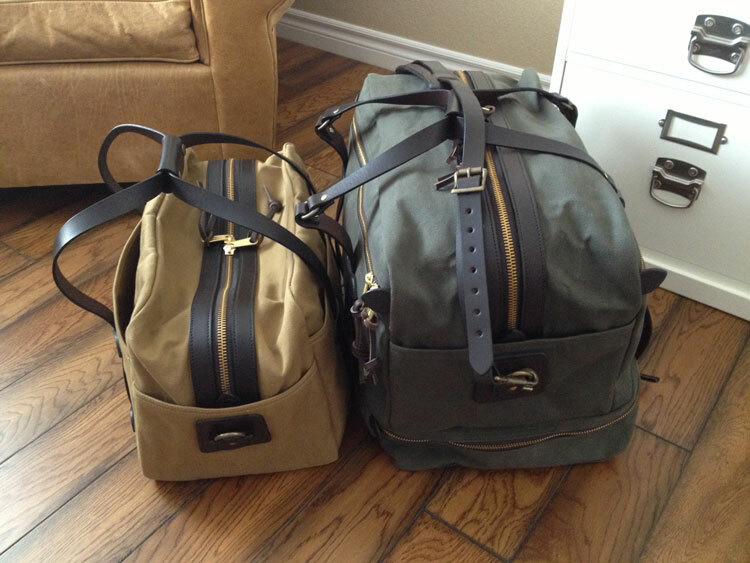 I know Filson doesn’t sell it anymore but there are a few places that still have them in stock. Hello, Todd…thanks for visiting the site. It really depends on how full you fill it, but I would say that in general it is not ideal for carry-on. I own the 238 and I use it all the time, but for ski trips, road trips, camping, etc. The Medium Travel Bag is a better choice if your primary use will be carry-on. It has similar loading capacity to the top section of the Outfitter, but has better dimensions for airplane travel. I was very surprised to see Filson discontinue the Outfitter Bag, but I think it was because it was fairly expensive (due to all of the workmanship that went into creating all of the pockets/compartments). If you can get your hands on one and you need a great all-around workhorse bag, I would say go for it. If you are only looking to carry on…then buy the Medium Travel Bag. Hello Charles, just wondering if you could please compare the medium travel bag with the small duffel as I’m in two minds about which one to get for an all-rounder: carry on, gym bag, weekender etc. I’m looking for a bag to pair with a 256 as I only want to buy two bags in total and have all bases covered for office work, business travel, sport, travelling…. The medium travel bag seems to make sense because of its organisation but not sure that it looks as good as the small duffel? Also which type of dopp kit/ wash bags do you prefer? There’s a new model out in navy, made of ‘vachetta’ – any experience with this material? This is one Filson bag that I have been underwhelmed with for two reasons. First, it is very difficult to pack because the straight top zipper does not allow easy access to the bag. Second, unless the bag is completely stuffed full, it carries very awkwardly, and in my opinion, doesn’t look very good. The bag tends to slouch down when packed lightly and it looks like you are carrying a scrunchy pancake. I also find the bag far too small to serve as a good travel bag. Perhaps 1-2 days of clothes (as long as you don’t need boots) and that is about it. This bag is the quintessential travel bag. It can be used for quick weekend trips or (with the use of packing cubes) I can get an entire week of casual clothes + toiletries. The zipper goes halfway down each side, so the bag is very easy to pack. The internal and external pockets make it very easy to stay organized and keep the things you need most close at hand. The one caveat is that this bag would NOT make a good gym bag…it is far too big and more structured. It is also much wider than I would consider for a gym bag because it would be hard to stuff into a narrow gym locker. These bags are very, very different in function, capacity and aesthetics. My concern with your plan to only buy one is that each is fit for an entirely different purpose. If I could have only one bag, I would definitely choose the Medium Travel Bag because it is much better weekender/carry-on than the Duffle and if you have bigger lockers at the gym could also serve double duty in a pinch. As far as dopp kits are concerned, other than my main travel bag, I am obsessed with minimizing weight so I use a dopp kit from Red Oxx Manufacturing (redoxx.com) who also makes fantastic travel bags and ruck sacks and I also rely on Tom Bihn packing cubes and pouches to keep me more organized (www.tombihn.com). Many thanks for your excellent response (as usual). I will take your sound advice and experience and am going to buy a 256 and then the medium travel bag (both navy I reckon), which should cover the majority of bases most of the time. If this doesn’t suit the gym then I can always get the zipped tote and share it with my wife. I will also embrace your philosophy on keeping this ultralight and well-organised within the bags themselves. To do this I am going to get pack cubes and a wash bag from Exped, a company that I’ve used before for waterproof stuffsacks and rucksack liners when I’ve gone trekking. Following your note I checked their website and they stock similar solutions to Redoxx and Bihn so I think I’ll stick with them as I know them and they’re stocked in plenty of places here in the UK. Now I just need to find a reasonably priced US retailer willing to ship to England…Cheers for your help! Hi Greg, thanks for your question. I have not seen the Outfitter Bag in stock at any dealer since Spring 2013. I am sure there must be a few of them at smaller dealers that have some old stock. Which size are you looking for? The Large or X-Large? Are you looking for a specific color? eBay is probably your best bet. I was lucky enough to find mine in the classifieds at StyleForum.net so that is worth checking out as well. It is really a shame that Filson discontinued the Outfitter bag. I think it became too expensive for them to manufacture, so rather than raise it to a price point that the market may not support, they just decided to discontinue it. It is by far the best made Filson bag that I own. Good luck in your search and if I happen to come across one, I will keep your email on file and let you know. Happy Holidays! Thank you for your question…are you asking about removing surface stains or does the entire bag need to be cleaned to remove mildew or odors? I believe Filson recommends brushing soiled bags with a nylon brush and letting them air out naturally. I have a reader who has had success soaking his bags for a few days, but then the leather needs to be restored/re-conditioned and the wax also needed to be re-applied to the entire bag. This process will also cause the bag to appear dark and shiny (which may not be the look you are going for). Brushing and allowing the bag to air out naturally and then conditioning the leather is usually the best approach unless the bag is heavily soiled…in that case soaking may be your only option. Do you know where one could get a 238? I just heard a rumor from Pinto Ranch that Filson is coming out with the outfitter again. The original 238 Outfitter is one of my favorite bags. It is great for separating dirty/wet items from dry items and the build quality and structural integrity is unmatched. The bag was discontinued a couple years ago (my guess is because it was too costly to produce) and at a retail price in 2012 of $450 it was not a huge seller. Last year (2014), Filson released a new, smaller, lighter version of the Outfitter bag (search on Zappos for “Filson Outfitter” and you will find it). This bag was made of a combo of Tin/Twill and I was surprised to find out that it too was recently discontinued after a very short production run. I am not sure what the future holds, but the original 238 Outfitter is definitely a bag worth tracking down on the secondary market. I hope this helps…thanks for visiting the site! Thanks very much. I found a new outfitter on Amazon at the Hanks Clothing store – but it was just too small. It is 1500 cubic inches smaller than the original, and for the same price. When it arrived, I found that you really couldn’t put a weekends worth of clothing and boots in it, like it seems you could in the original. I will definitely be looking to buy an original in the secondary market – and would love to buy yours if you ever sell it. Thanks! 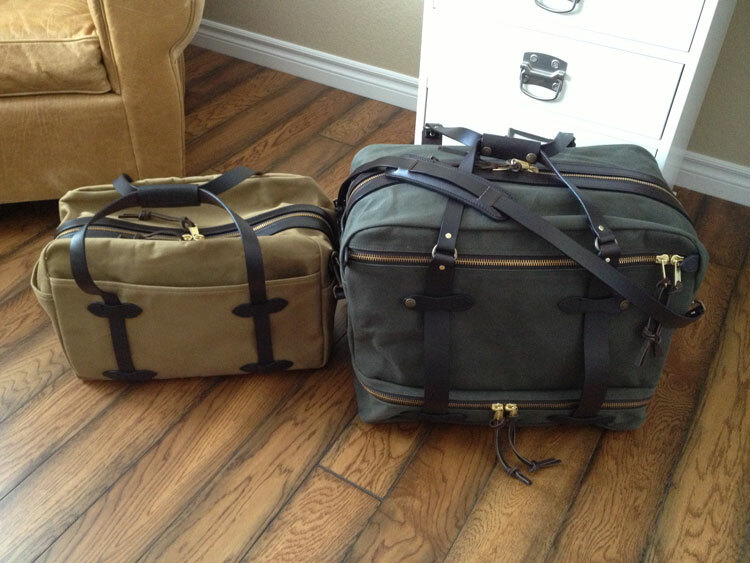 I have some filson bags for sale, but not my 2 outfitters…just too hard to replace. The Deluth bag is very good , more flexible, lighter weight and good value. I can’t find anything on the Deluth – are there pictures anywhere? Any other filson bags? You mention that this is similar to the 248. About how many days worth of clothing would fit in this bag? Also is it carry on friendly or should it be checked?